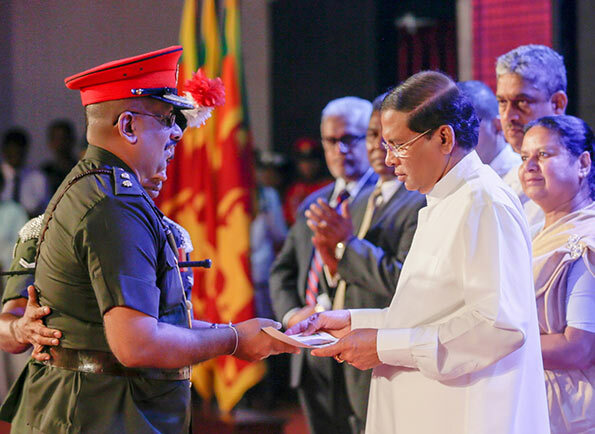 “Whatever abuses, insults and allegations directed to me, I am dedicated to make a similar commitment like the valiant war heroes who made sacrifices to bring about an ever lasting peace in the country”, says President Maithripala Sirisena. “Some narrow-minded political extremists are accusing me stating that I am trying to break the country into two parts by arresting the members of intelligent sections and thereby destroying the national security. But, I refuse all these allegations as the commander of the tri-forces who is responsible for the security of the country”, the President said. 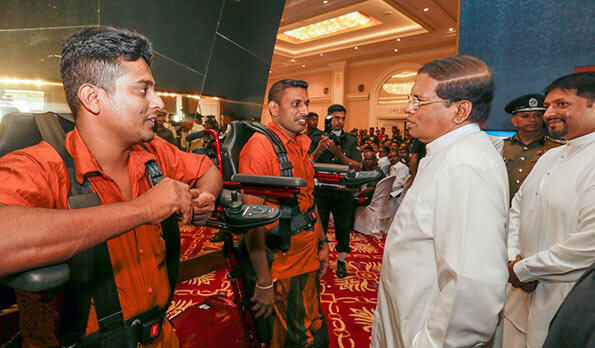 The President made these remarks at the ceremony held at the Temple Trees yesterday (Jan. 25) to issue ‘Virusara Varaprasada’ benefit card offered to the families of the disabled war heroes of the tri-forces by the State Ministry of Defense. President Sirisena said he would be committed to make the Sri Lankan Tri-forces to a world renowned force while protecting the dignity of them. “According to the responsibility I had as a reasonable minister before January 08 2015 and with the responsibility I have today, I will work to take the country towards the development by strengthening of the national security”, he said. “No matter who was the Leader of this country before January 08, 2015 and after January 08, the country today has a questionnaire to answer in front of the international community. The civil society is also requesting us to answer it. Therefore, the government should answer it”, the President further stated. “The investigations regarding that will never aim war heroes or the members of the intelligent service”, he added. “Some people have started to speak about blood today. Whatever religion we follow, whatever language we speak, we all have the same blood”, the President said. He also pointed out that everybody should get together to build a country where every people can live with peace and happiness by discarding the narrow ideas as the people in a developed civilization. The ‘Virusara Varaprasada’ benefit card is an honor extended to war heroes for their peerless commitment done. This is offered to the offered to the family members of the war heroes by the State Ministry of Defense. This covers the sections of customer services, health, education, finance and insurance. The President symbolically handed over the Virisara cards and 100 scholarships to the children from Jaffna, Mannar and Vavuniya at this occasion. Ministers Nimal Siripala de Silva, Harin Fernando, State Minister Ruwan Wijewardena, Defence Secretary Karunasena Hettiarachchi, Secretary to the Minister of Justice and Peace Jagath Wijeweera, Commanders of the tri-forces Field Martial Sarath Fonseka and the Chairperson of the Ranaviru Seva Authority Mrs. Anoma Fonseka also participated in this ceremony. What he meant by we all have same ‘BLOOD’? Define who are these ALL? I have seen many time he barks, but no actions. your actions betray your deeds. You have authorised the arrest of Ven Gnansara on petty charges whereas you entertain criminals and muederes in parlaiment. You allow Kathikawath bill is designed to gag the bhikkus and this would only polarise the nation and you are cursed. When you want votes you seek the blessings of the priests is it blessing you seek or seek an endorsement but i doubt this would happen. What is this BLOOD? When we hear BLOOD our blood get boiled. Sinhalee, Bibalee, Bicycalee, Bothalee… That said, SINHALE is a name for Sri Lanka. I do not know why some people allergic to this word? Irrespective of what language we speak and what religion we follow, the blood in our bodies is the same. Nowadays, there is something called Sinha Le (Blood of the Lion); a few years ago, there was something called called a Koti Le (the blood of the Tiger). We all know where the Koti Le disappeared; the same fate is likely to befall the Sinha Le. I wonder why Sri Lankan Le has not been discovered yet. The day it is discovered, we will be a new nation. What? Are you stupid or something else? Same blood ? Please don’t insult me. I feel like commuting suicide.